A twentieth-century innovation, foreign aid has become a familiar and even expected element in international relations. But scholars and government officials continue to debate why countries provide it: some claim that it is primarily a tool of diplomacy, some argue that it is largely intended to support development in poor countries, and still others point out its myriad newer uses. Carol Lancaster effectively puts this dispute to rest here by providing the most comprehensive answer yet to the question of why governments give foreign aid. She argues that because of domestic politics in aid-giving countries, it has always been—and will continue to be—used to achieve a mixture of different goals. Drawing on her expertise in both comparative politics and international relations and on her experience as a former public official, Lancaster provides five in-depth case studies—the United States, Japan, France, Germany, and Denmark—that demonstrate how domestic politics and international pressures combine to shape how and why donor governments give aid. In doing so, she explores the impact on foreign aid of political institutions, interest groups, and the ways governments organize their giving. Her findings provide essential insight for scholars of international relations and comparative politics, as well as anyone involved with foreign aid or foreign policy. "Offers a dispassionate and thorough examination of a government activity of continuing and even growing importance." "Lancaster offers a helpful and thoughtful retrospective account of sixty years of aid practices and a useful study on the question of how we got to the norms, bureaucracies, politics, and institutions that govern foreign aid today. For academics and practitioners alike, Lancaster’s study offers a compelling narrative for understanding why governments give aid, how it is done, and what it is expected to accomplish." "Because Lancaster has the dual vantage point of having been a government official and a professor, the analysis rings true and eschews simplistic motivations and conclusions." "Foreign Aid succeeds in reminding the reader that development assistance programs were born to further the diplomatic and security interests of the governments that created thme." "This is a comprehensive assessment of why aid is given, rich in historical and institutional detail, and meticulous in its coverage of the economic and political factions which affect aid programmes." "This is an important contribution to the literature on comparative foreign policy making." "[The] study provides a useful insight for postgraduates and academics of international relations and comparative politics, as well as practitioners involved in the field of aid giving and foreign policy. It also provides an accessible introduction for newcomers to the topic." 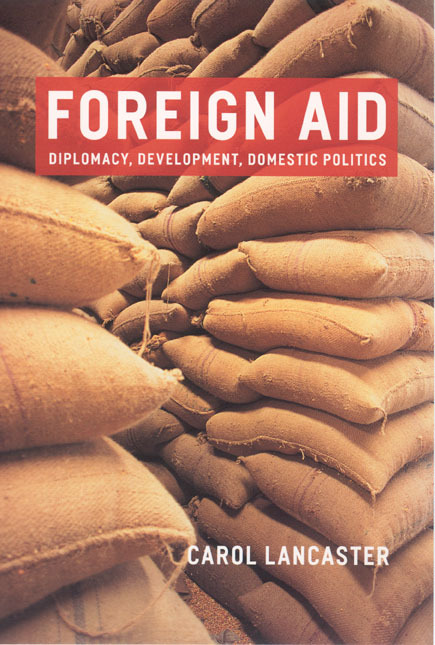 "Lancaster affords a significant contribution to the current scholarly work on foreign assistance, as she elucidates the aid problematic and its complexity with a refreshing and suitable set of case studies. She writes for an educated, well-read audience, yet reaches beyond specialists in her field, and offers an intelligible, eloquent comparative analysis on an intriguing issue that will remain on the political agenda of governments in the twenty-first century."